Additionally, interlocking pavers are easy to work with. 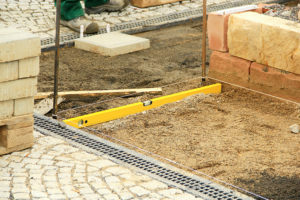 You don’t need expansion joints to install them, and if something goes wrong with one paver, it’s easy to swap it out and leave the rest of your design untouched. Finally, interlocking pavers just look nice. They come in a wide range of colors, textures, and shapes, allowing you to create all sorts of creative designs. But like any hardscaping project, you need to take things step-by-step. 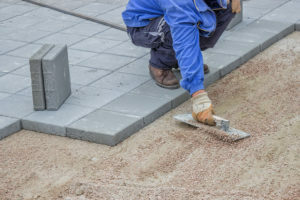 Whether you’re installing a new patio or creating a one-of-a-kind driveway, here’s how to make sure you install your pavers the right way. If you’re unfamiliar with any of these items, make sure you consult with a landscape supply store before you begin. 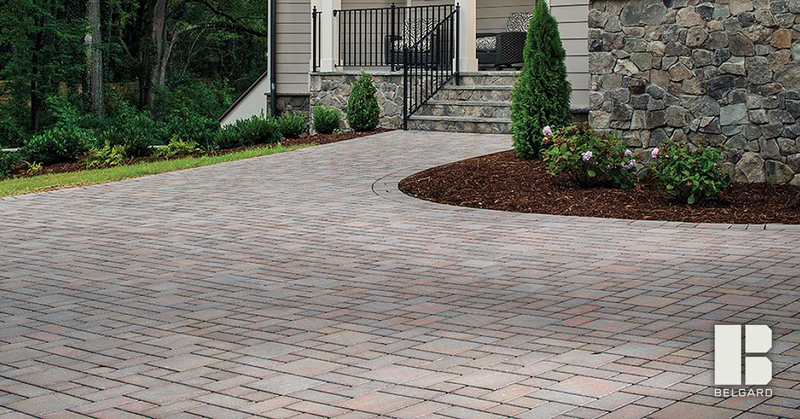 Start by figuring out where you want to install the pavers and how much space you’ll need. It’s important to choose a place that has proper drainage. Avoid areas that tend to flood after heavy rains. From there, mark off the area with spray paint or stakes so you can visualize the size and shape of the area you’ll be working with. 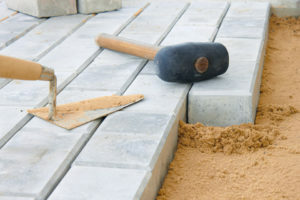 Measure the length, width, and depth of the area to determine how much sand and gravel you’ll need to create your base. You will need to add a foot to both the length and width of the project for the base materials. A landscaping supply store or contractor should be able to help you determine how much material, in cubic feet, you’ll need to complete the installation. It’s hard to run out of choices when picking pavers, thanks to the array of different shapes, colors, and thicknesses. 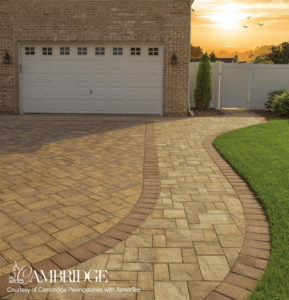 The standard thickness for pavers designed for pedestrian traffic and some vehicle traffic is 2 and 3/8 inches, which is what you’ll find with brands like Cambridge Pavingstones or Belgard. The base is the foundation for your new patio, driveway, or backyard living space. Before you begin, be sure you contact your local utilities to make sure you don’t hit any gas or power lines. In New Jersey, Dial 811 for New Jersey One Call. You’ll need to dig up loose or unstable soil until you reach compacted dirt. How far you dig will depend on the thickness of the gravel and sand layers, as well as the pavers, and also how you’ll be using the space. For an area that will need to handle average pedestrian traffic, dig down about seven to nine inches to install four to six-inch gravel layer. Add another two inches to that equation for areas that will see vehicle traffic (even more if you’ll be parking a heavier vehicle – such as an RV – on your driveway paving stones). This base layer needs to be compacted and must be flat- sand and pavers will follow this contour. Your sand layer should be no more than an inch-and-a-half thick. Make sure you work with the right quality sand. We recommend coarse concrete sand. Your landscaping supply store should be able to help you with this. Lay your 1” pipes on top of the base. Pour the sand. Using your rake, pipe and 2×4, guide it into the spaces and even it out. If the sand isn’t even, your pavers won’t be either. Put the 2×4 on top of the pipes and screed the sand over the area between the pipes. 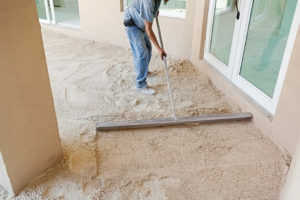 Once you’ve made sure the sand is level, do not allow anyone to walk on it until the rest of your installation is complete. Use some sort of restraint – plastic or metal edging– to keep pavers from moving around as you install them. You might want to draw a diagram for how you want the paver pattern/design to look. 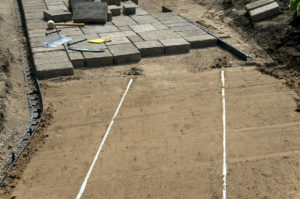 In addition, stretching strings across the sand base can help keep the pavers straight. Work slowly and carefully, installing pavers with two hands, making sure you lay them down flat to keep the sand base flat and even. You’ll finish the interlock process with a different kind of sand, known as joint sand, or polymeric paving sand. This product is a combination of sand and polymers, which form a binding agent. Pour this sand out over the paved area, then sweep it into place until it fills all the joints. Using the plate compactor, compact the sand into the joints. If you are installing highly textured pavers you will need put a pad or thin plywood under the compactor to avoid damage to the pavers. 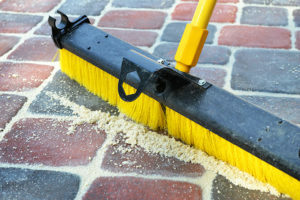 Sweep away any excess sand when you’re done. When polymeric sand comes in contact with water, the polymer binders lock the sand together, creating a secure joint compound to lock your pavers in place. Be sure to follow the directions on the poly sand bag for this process. Regular sand, on the other hand, will eventually wash away. Questions about the installation process or supplies needed? Yardville Supply is here to help. We not only have the tools and materials we’ve mentioned here, but a massive outdoor paver gallery, featuring products from Cambridge and Belgard pavers. More than that, we have the expertise you need to complete your paving project, whether you’re installing a new patio, walkway, or driveway. If self-installation seems like more time or work than you want to take on, we can put you in touch with one of our preferred contractors. Visit our supply yard today and we’ll get to work on making sure your paving project is a success. Previous Previous post: What’s the Difference Between Aluminum and Steel Landscape Edging?